The venue is in Co. Leitrim near Keshcarrigan. NEWS: see below for the good news about the reduced workshop fee. 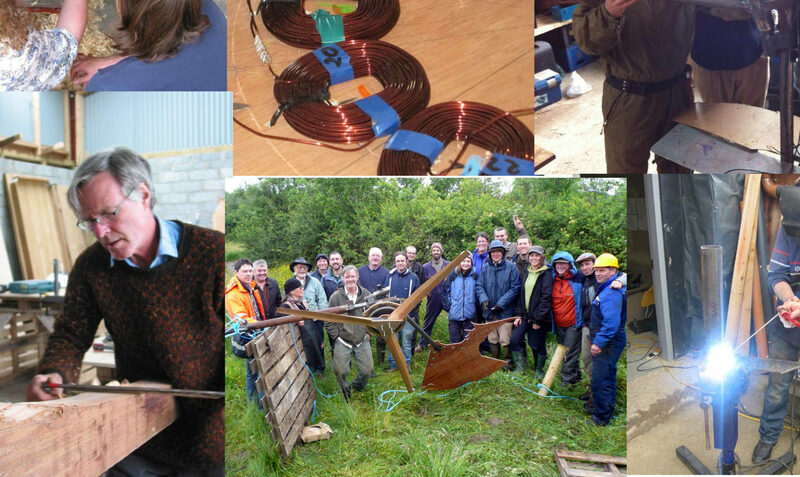 The course participants will learn many skills and also the theory involved in a domestic wind turbine. A domestic wind turbine will be built from scratch on the course. We will discuss various mounting systems, inverters and control systems, off-grid and grid-connected systems. At each stage of the process the participants will gain hands-on experience. these courses are to teach you how to build a wind generator, so please do not expect that you will go home with a completed wind generator. This is a practical, hands-on course where the participants will learn to build a wind turbine from start to finish, participating in every stage of the process. The course should appeal to those with an interest in learning more about renewable energy, specifically wind energy and how to provide energy for the home or farm. Ideal for people from the farming sector, general public or professional trades people who wish to learn first-hand from people who have been involved with renewable energy for years. Price for the workshop has been reduced from €350 euro, thanks to the Leitrim Development Co we can now offer places on the workshop for the very low price of €100. Let us know if you need help finding accommodation or alternatively you can camp at the farm for free, just contribute to the food bill. There will be one meal a day supplied for course participants, plus tea and coffee.